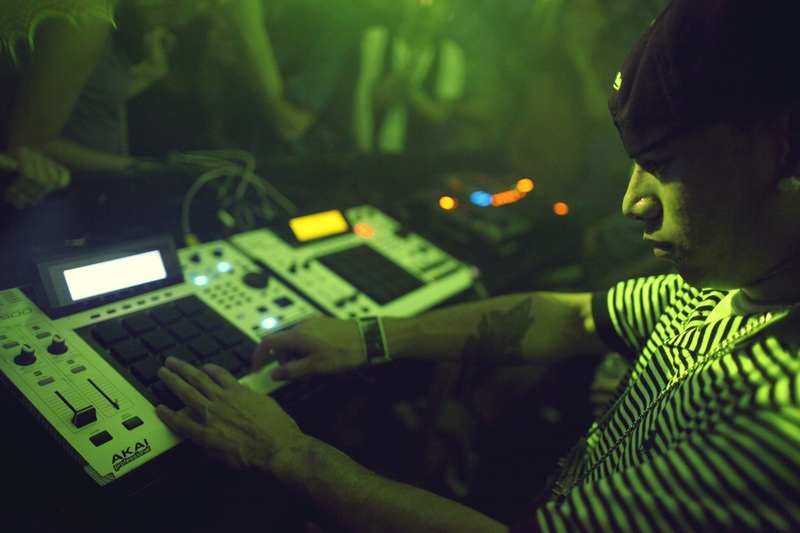 Hailing from Austin, TX, SuperVision has had 15 years under his belt in the art of turntablism. His samples on much of his production are from records he has scored on his journey’s around the country. The sounds you can hear coming from the speakers this Thurzday will be futuristic electronic hip hop beats. His latest EP is “Telekentic”, it was release on Pretty Lights Music. The record has a load of heavy sub bass and a variety of the most ridiculous samples around. Some of the craziest remixes of popular tunes including, Pretty Light’s “Always All Ways” have came out of it brain. This week you can hear him live Thurzday at The Mousetrap before he takes off to Summer Camp. Also on his agenda for the year is Wakarusa and InfraSound music festivals. You can’t beat seeing him a measly $5, so you should make it a point to be at this show! Abel recently founded another label “Destroid Records”, upon its debut release a full length digital album was released with the majority of tracks by Excision himself and collaborations with other artists such as Downlink, Space Laces, Far Too Loud, Bassnectar and Ajapai. Another single was released in December 2013 by Excision & Space Laces entitled “Get Stupid”. There are more releases scheduled to be released on Destroid Records. In January he released a free downlowd with Downlink entitled “Rock You”. Check them both out below. Dirtyphonics is a French electronic music group from Paris, formed by Charly, Thomas, and Pho in 2004 and joined by Pitchin in 2009. Their music style is based on Electro, Dubstep, Drumstep, and Drum and Bass. In 2008, Dirtyphonics was originally signed on Shimon’s label AudioPorn Records. After releasing remixes on many labels, such as Mau5trap, Cooking Vinyl, Ram, MTA, Ultra Records, they joined Dim Mak Records in 2012. Dirtyphonics has worked with Linkin Park, Skrillex, Kaskade, Benny Benassi, Foreign Beggars, NERO, Modestep, Steve Aoki, Marilyn Manson, and many more through collaborations and remixes. ill.Gates is a Toronto-based composer, performer and educator. Over the past 16 years, he has established a global fan base and a reputation as one of the most dynamic electronic music artists around. He regularly tours across North America, Europe, Australia and Asia. Gates has headlined at such festivals as Burning Man, Shambala, the World Electronic Music Festival and the New Orleans Jazz Festival. His first full-length release, Autopirate (Muti Music, 2008) charted and continues to sell strongly. His upcoming triple album The ill.Methodology and accompanying online course are highly anticipated. Gates was recently selected as one of the Next 100 by URB Magazine. Joe Torre aka MitiS, was brought up in Pennsylvania as a classical pianist. He has been making his way into the Electronic music scene for the past two years and has been producing tracks from genres Dubstep to Electro. After experiencing the classical world of piano playing in renowned Halls such as Carnegie Hall in Manhattan NY, and the Kimmel Center in Philadelphia, Joe became MitiS to give the Dance music scene a run for it’s money. “I find myself unable to stop making phat basses, heavy beats, and throwing melodies into the mix… I Can’t think of anything else more appetizing; It’s the new age Classical. The musical partnership that started between Andy Joplin and Jerrod Jordan, AKA Kicks n Licks, started a number of years ago and has developed to be an endlessly creative duo that is supplying exciting results both in the studio and in live settings. $5 for all this Bass! Mochipet AKA David Y Wang was born in Taiwan, to a rocket scientist father and a kindergarten teacher mom, has been all of the continent leaving a fossilized imprint whereever he lands. His music can be found in video games and on TV shows. There are so many artists he has had the opportunity to work and has shared the stage with, for instance MIA, DJ QBert, Spank Rock, Flying Lotus, and Meat Beat Manifesto just to name a few. Mochipet’s music has even been played by a 20 piece orchestra at New York’s Carnegie Hall. With a number of big releases over the past few years, Mochipet’s library is full of some very intricate styles. The most notable works thus far being “Sharp Drest”, “RAWR Means I Love You”, “Who Da Boss” and he has done a number of remixes raging from Big Boi’s “Shutterbug” to Black Sabbath’s “Sweet Leaf”. The newest remix to be added to his collection is DJ Sol Rising’s “Around the Clock”. We here at IndyMojo.com got the chance to ask Mochipet a few questions about his life, music, and opinion on EDM in America. He had some interesting things to say about his influences and the cultural difference between the US in the electronic scene. MOJO: What artist influenced you to start making music and what producers would you say influenced your style? MP: This is retarded but Slash from Guns and Roses. I don’t know why when I was a little boy I use to watch Slash and he just seems so cool to me. I wanted to be like Slash. After Slash I would have to say Frank Zappa and Miles Davis. They were also my Heroes. MOJO: You were born in Taiwan, how would you say this directly or indirectly influences your music style? MP: Directly for sure, I am very thankful to have the combination of 2 very different cultures in my life. It gives me a very different viewpoint than most people. MOJO: You’ve had the opportunity to work with some great talent, is there anyone on your wish list to do a collab with? MP: David Lynch, I wanna collab with David Lynch. MOJO: You run your own record label, Daly City Records, how did that come about? MP: I wanted to find a way to release the music of my friends. MOJO: You’ve played in many cities and countries, tell us a few aspects about the different cultures you’ve experienced and differences between them and the US EDM culture. MP: EDM has just became Mainstream in America. EDM has been Mainstream music in the rest of the world for quite some time now. So we’re just getting the initial explosion. It will be interesting to see what will come of it when the dust all settles. MOJO: The scene has been through some dramatic changes in the past 4-5 years. First the rise of Dubstep, the birth of drumstep, the fist pumping electro house, the short lived moombahton, the rerise of DnB, and the never ending tRap movement. What do you foresee being the next big thing in electronic music? MP: Non Dance Electronic Music. This has yet to be popular in the US and in many countries like Europe it’s what followed after the big EDM Explosion. MOJO: What’s on the horizon for you? MP: Good things I hope! MOJO: What does Mochipet do when he’s not destroying dance floors and making unforgettable beats? MP: I’m on juice kick right now I’m juicing everything, including Steak! MOJO: What album or artist have you listened to recently you would recommend? MOJO: What is the craziest thing you’ve seen at a concert/festival? MOJO: Where did the name Mochipet come from? MOJO: What can Mojostock goers expect to when you take the stage this Friday night? Mochipet starts at 11 PM the Friday night of Mojostock @ Sleepybear Campground. Here is the link for the full Mojostock schedule : http://www.indymojo.com/mojostockschedule . Check out the links below to get more info on the man in the dinosaur suit. Content overload for you today. There is some serious releases coming out this week. Plenty of new things to look out for and available now for your face-melting pleasure. Them Lost Boys’ new EP is massive, Bro Safari and UFO! with a full length LP for free and Indy’s own HaveThat releasing his debut album on Rad Summer. Free bangers and wub wubs for you, as well as some stuff to break out your wallet for. Get it! Get it! Hope everyone had a great Father’s Day. There is some funk in the air and Falcon Funk is the one smoking it. Helicopter Showdown has some Cali Born Hacker Crap this week. Figure dropped a Gankstep track. With so much of this free means more money for the 3 B’s. The “basses” are loaded to melt your face. Falcon Funk is a Swedish producer who is also can be known as F.O.O.L and Rasmus Hermansen. This new project of his is true to the funk arts. Amazing production of Glitch, Funk, and Dubstep. Pick it up at Beatport.